This is the second installment of a three-part New Year’s Hear the Music series on Paul’s coming-of-age images in Galatians 3:23–4:11. You might want to read that Scripture first. You can read the first installment here. Ringing hand bells in high-school ended up being the last time I was taken in by my participation in music-making. By college, I might have been obeying the score, but I couldn’t hear the music anymore. The second Hebrew tradition is similar, a derivative, but less obvious. It involves the inheriting child, usually the first-born son, donning a garment that his father gives him as a sign that he is heir. You remember how irritated Joseph’s brothers were because of the “coat of many colors” that Jacob gave him? Joseph’s older brothers didn’t plot his murder and eventually sell him into Egyptian slavery because Dad gave Joseph stripes, and they only got polka-dots. No. They hated him because their father gave Joseph the family inheritance coat. It signaled that when Jacob died, Joseph would receive a double portion of Jacob’s wealth and Joseph would rule the family. So when Paul suggests that the Galatian believers clothed themselves in Christ, put on Christ with their baptism, he’s claiming more than initiation. He’s claiming investiture, with all the honors, rights and privileges pertaining thereto. Putting on Christ is the outward sign that believers have inherited Christ’s character, his ability, his joy in doing the family business. Jesus, not only did the Father’s will by obeying Nanny Law’s rules, he lived his Father’s life as well. Because Jesus reached his majority and was released from the regency of the rules, we DO too, through faith in what he accomplished. Think about it. 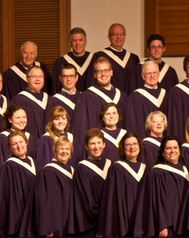 When someone puts on a purple choir robe and climbs into the choir loft, we don’t care if you’re Swedish or Somali. We stop thinking about whether you’re a sewage-treatment specialist or a CEO. What we want to know is, “Can you sing the music?” We came to church to hear some “Herald Angels Sing.” Male and female doesn’t even matter. If the choir director need tenors to round out the sound, and you can sing tenor, then you sing tenor—whether you’re a man or woman. Too much freedom is hardly the problem here, though. In an effort to look the part, the Gentile Galatians have simply traded their pagan rules for Jewish rules. They started out religiously obeying the expectations of their society—keep their curbside clean, drive cautiously, work hard—but now they’ve added the religious expectations—attend Wednesday night church, dress their boys in bathrobes for the Christmas pageant, and serve on church committees. Think about a time last year when your faith devolved into a task-list or your attempts to do the right thing felt like vain labor. During those seasons, what was the longing of your heart? How does your inheritance of Christ’s character and power and joy impact both the longing and the labor? Check back tomorrow for Hear the Music, part 3: Sing the Song. This entry was posted in Calendar, Feast of the Holy Name of Jesus, Galatians 3:23-4:11, New Year's Day, Scripture Passages and tagged choir robe, coat of many colors, freedom, Galatians 3:23-4:11, inheritance, law, New Year, rules. Bookmark the permalink.